Members of the Lady Monarch golf team display their championship trophy from the Union-Madison county tournament. They are from left, Cassi Van Dyke, Olivia Virts, Madison Powers and Olivia Ishmael. 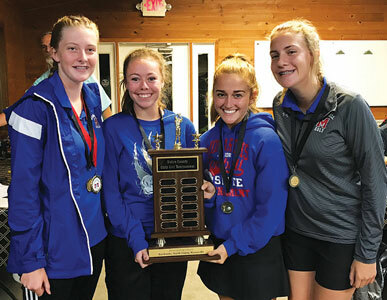 The Lady Monarch varsity golf team won the Union County portion of Tuesday’s Union-Madison county tournament. The event was played at Locust Hills Golf Club near Springfield. MHS shot a 194 to beat Fairbanks (207) and North Union, which didn’t score four golfers. Marysville also won the overall trophy by beating Jonathan Alder (213), which won the Madison County portion of the event. Other teams that competed included London and Madison Plains. MHS freshman Cassi Van Dyke was the medalist for the tournament as she carded a 45. Olivia Virts and Madison Powers each shot a 48, while Olivia Ishmael finished with a 53. Shelby Jones and Veronique Grand led FHS with scores of 51. They were followed by Mary Weisburn-52, Allison Kise-53, Gabby Vamos-59, Kaylee Mitton-63 and Shelby Burns-72. Maddy Snyder led NU with a 54, while Katlyn Saunders and Kendra Nicol each carded a 61. Sarah Harp led Jonathan Alder with a 48. Olivia McCoy shot a 53, followed by Abby Doza-55, Katie LeMaster-57, Madi Baker-58 and Katie Hooley-62. Fairbanks’ boys moved to 12-0 in the Ohio Heritage Conference with a 165-185 victory over West Jefferson. Justin Brackenridge and Travis Brake each shot a 40, followed by Alex Crowe-42, Logan Bocsy-43, Seth Payne-45 and Aidan Wilson-50. Jonathan Alder’s boys upped their Central Buckeye Conference record to 9-0 with a triangular victory. The Pioneers finished with a team score of 158, while Shawnee tallied a 162 and Bellefontaine finished with a 173. Alder’s Tyler Hilbert tied with Shawnee’s Shawn Lyons for medalist honors. They matched scores of 37. Mychal McKelvey and Hayden Mitchell each carded a 38 and Liam Thompson finished with a 45. Coy Knotts carded a 46 as the Cardinal boys downed Mechanicsburg, 191-207. Cole Pond was right on Knotts’ heels with a 47, followed by Payton Oyer-48, Jalen Nott-50, Ryan Gross-52 and James Russell-53. North Union’s boys scored a 180-186 victory over Benjamin Logan in CBC competition. Cody Rausch led the Wildcats with a 42, followed by Nick Reed-44, Connor Cox-46 and Blain Keckler-48. Marysville’s JV boys beat Olentangy Berlin, 179-194. Corey McNicholas-40, Dylan Delauter-44, Alden Prohaska-45 and Cole Weaver-50.